Has your property recently suffered fire or smoke damage? We can help. ServiceMaster Restoration by Zaba offers a comprehensive line of fire and smoke damage cleanup services for Chicago and the suburbs. Our team is standing by ready to repair and restore your property to its pre-fire condition. 1. An Emergency Response 24/7. With headquarters in both Chicago and Skokie, our teams respond to emergencies 24/7. Our fully stocked fleet vans arrive on the scene within 90 minutes of your call, and we get to work immediately fine-tuning our fire damage restoration process to your property. 2. Detailed Fire Damage Assessment. We perform a thorough inspection of all damage to determine the structural integrity of your home or business and the condition of your belongings. Our technicians identify the source of the fire, classify its type and report our detailed assessment and estimated repair costs to you and your insurance agent. Often, fire damage makes it impossible to close windows and doors, and it compromises the strength and stability of walls and roofs. Our fire restoration process addresses these problems with secure board-up services that ensure the physical safety of your property. Water left over from extinguishing a fire permeates infrastructure and saturates furniture and belongings. Our technicians use industry-proven equipment to take care of water extraction, and then we finish up with state-of-the-art drying and dehumidifying techniques. 5. Smoke & Soot Removal. Our teams tackle smoke and soot cleanup from every affected surface in your property as well as all furnishings and personal belongings. We carefully clean and thoroughly sanitize everything with specialized smoke and soot mitigation products and techniques. From minor plumbing repairs to wall reconstruction, we finish your fire damage recovery process by restoring your property to its original condition. 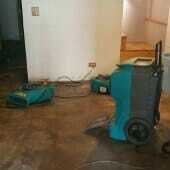 Our teams replace flooring, deep clean tile, repair baseboards and repaint ceilings. We handle all aspects of the project with industry-established fire damage restoration procedures and standards, and we restore your property with the highest quality materials and workmanship. What can I do now before help arrives? It’s very important to understand the potential dangers in your home after a fire. The structure may look sound, but wait for the all clear from firefighters before going back inside. Don’t attempt any fire damage cleanup until the house has been inspected by a licensed electrician. Once you’re sure everything is safe, start the cleanup process by following these seven tips. 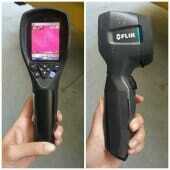 Document all the damages to your home and belongings by taking pictures. Do this before you begin cleaning. Be sure to include things that will eventually be thrown away. Make the photos part of an inventory that supports filing your homeowners fire insurance claim. Open as many doors and windows as possible even in rooms that weren’t affected by the fire. As fresh air circulates through the house, smoke odors begin to dissipate. This doesn’t completely clear interiors, but it’s a start to restoring fresher, healthier indoor air quality. Power Tip: If the weather outside is hot or damp, don’t open up the house. Otherwise, high temperatures and humid conditions outside work against efforts to ventilate the indoors. Replace all the HVAC filters in your home with high quality HEPA filters. Tape double layers of cheesecloth over air registers. Don’t plan on running the system during cleanup. Your goal is to keep it from accumulating any more airborne debris and particles like mold spores and soot. Power Tip: Before you finally turn the system back on, call in a licensed HVAC technician to inspect the unit. Also, have the ductwork decontaminated by a certified cleaning contractor. Soot and smoke cleanup is a messy, sticky process, so secure furnishings and belongings before you get started. Move unaffected items as far as possible from areas that need cleaning. Use plastic sheeting or old linens to cover things you can’t move. Protect table and chair legs with plastic wrap or aluminum foil. Even if you only plan on initial cleaning before professionals are on the scene, be very careful. Whether you do a little or take on the entire project, closely follow our DIY smoke damage cleanup guidelines. Wear proper personal safety gear that minimizes your exposure to dangerous soot particles. Power Tip: Don’t underestimate the size of a home fire cleanup job. 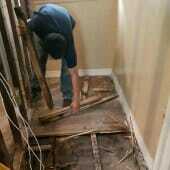 If you have any doubts about doing it yourself, leave the work to house fire damage restoration professionals. Different upholsteries and frame materials require different types of cleanup after a fire. It’s important to use the right products especially when cleaning leather. If you’re not sure about furniture fabrics, check tags attached to cushion backs or the bottom of frame dust covers. Cleaning up after a kitchen fire requires careful steps to remove soot and smoke damage, but you also have to clean inside areas like pantries, drawers and cabinets. Smoke and high temperatures from a kitchen fire ruin packaged and canned food, so be prepared to throw everything away. Cleaning up after a house fire exposes you to a number of personal safety hazards. Unsound structural materials, compromised utility lines and soot and smoke damage create a dangerous environment inside your home. We ask that you always be cautious. If cleanup seems like more than you want to handle, don’t take any chances. Leave the job to our professional fire restoration technicians in Chicago, IL who know how to keep you and your property safe during the fire damage restoration process. Can you recover fire-damaged furnishings and belongings? Our certified technicians use a variety of industry-proven techniques that enable us to take special care of personal belongings. You can expect costs to run between $3,000 and $20,000. These are the typical costs for Chicago fire damage restoration. It’s important to understand that these figures represent averages. No two fires are ever alike and neither are the damages. We have no way of knowing the extent of fire damage to your property or belongings without an inspection. To be accurate and fair, we can’t give you an estimate until we’ve made an on-site assessment. Be very careful of any restoration company in Chicago that offers figures based on your phone call. Does my home insurance cover fire damage? Most property insurance covers 100 percent of your fire damage cost, but you’re responsible for paying a set deductible. Your agent is your best resource for coverage information, and our staff can help you navigate the process too. Don’t remove furnishings or belongings from damaged areas until your carrier gives you the OK. Your insurance company has to establish the fire’s origin and cause, and you don’t want to slow down the adjuster’s work. What kind of factors affect the final costs? It often depends on the cause and type of fire. For example, kitchen fire cleanup requires specialized techniques and products. On the other hand, buildings with fire sprinkler systems don’t always suffer from extensive damage. What type of special equipment and tools do you use? These sensitive cameras detect moisture hidden in walls, floors and ceilings. We record and plot their imaging to map out areas that need both fire and water damage remediation. This workhorse line of fire damage cleaning equipment allows us to quickly clean up microscopic debris so that it doesn’t further compromise indoor air quality. Cleaning up fire damage usually includes drying out soaked infrastructure. Our heavy-duty air movers speed up the fire restoration process by circulating high-volume airflow. 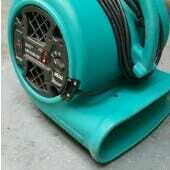 Damp subfloors and ceilings quickly dry with the powerful, indirect airflow generated by these fans. Their aerodynamic design, variable speeds and light weight make them restoration essentials. This naturally-occurring compound also destroys airborne odors. It’s effective as both a stand-alone smoke damage restoration product and an additive to air-scrubbing equipment. We use this industry-approved equipment to eliminate the smells that permeate a fire-damaged property. 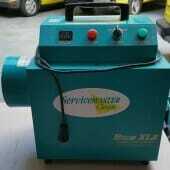 Our ozone generators clear the air by destroying spores, bacteria and odor-causing molecules. You can thank these fire restoration products for recovering all kinds of items. We use them on everything from fabrics and electronics to baseboards and ceiling fans. Our arsenal includes fire cleaning chemicals, green products, liquid encapsulates, degreasers, deodorizers, disinfectants and a long list of items that you won’t find under the kitchen sink. What does it mean to be designated as a vetted Quality Restoration Vendor? We consistently earn our QRV certification with insurance carriers locally and nationally. They know that we tackle all projects with the highest quality workmanship, superior equipment and solid industry know-how. We also act as your advocate by working with your agent and helping with the paperwork.